Aircall is the cloud-based phone system of choice for modern brands of 3+ users. By seamlessly integrating with the most popular CRM and Helpdesk tools, we help sales and support teams communicate clearly and efficiently. 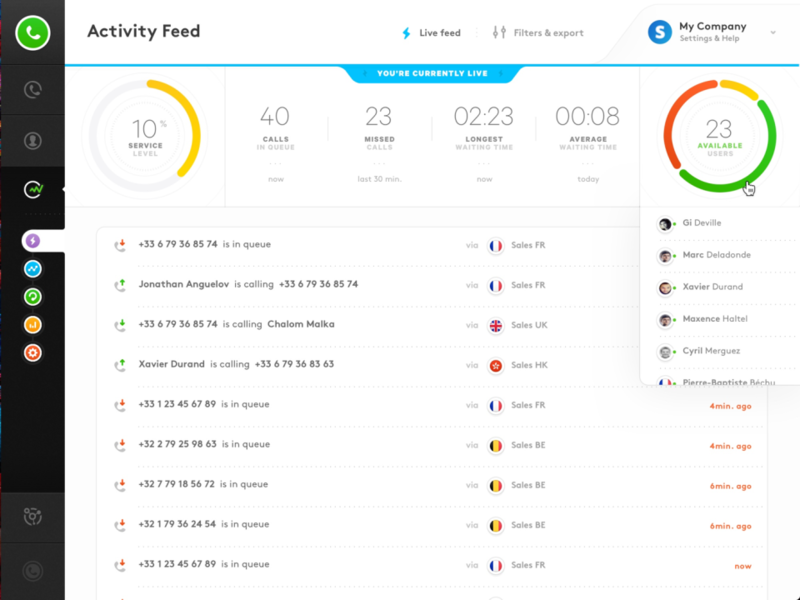 Admins can instantly add numbers from 100+ countries, scale their teams according to seasonality, and gain deep insights through real time analytics. Accessible by desktop and mobile app, Aircall is trusted by over 3000 companies worldwide. Start a risk-free trial today! Pros: I could set up a call center in matter of minutes, and it is very easy to use! And the calls that arrive, we can forward to personal mobiles, that has helped us to make sure that we would not lose any important calls. The best part is, we can record and make a note of all the calls, and we can also put up a setting for greetings. The desktop app is self-sufficient to receive calls, and I should say the quality of these calls are just awesome. The customer service team is very responsive, they have quickly got back to us whenever we had any concerns. The application integrates with pipedrive, slack and thereby had helped our staff to stay connected for better support. The application is very much cost effective in comparison to the features it provides. Cons: We need a strong internet to use this application. There are a lot of updates available every now and then, but updating and restarting of the application has become a very irritating task. Pros: - Aircall gives me freedom to take calls away from my desk. Using the forward to mobile feature I need not worry that i'll miss something important - Equally as advantageous, is the feature to track and monitor calls as well as set greetings. This ups the professionalism of the business to new heights. Customers can't believe that we're just a small office working out of Seattle. 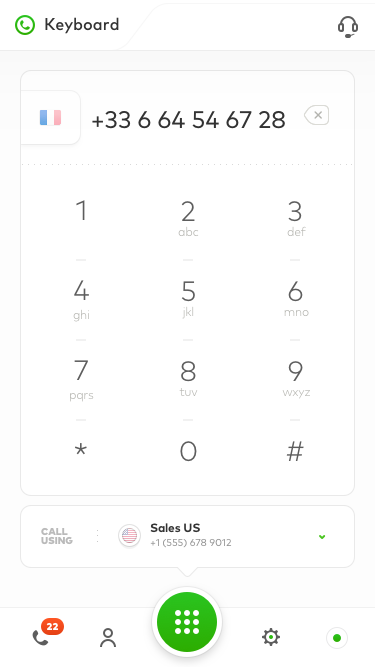 - My favorite feature by far is the ability to easily dial out and receive calls via the desktop app. This has really improved our business being able to easily communicate with outside contractors and investors around the world. This is the 21st century, and it's about time we're finally able to communicate like it. Cons: - As this does run on internet connection, calls can be a bit choppy if you don't have the best Wi-Fi. (Which has resulted in the app crashing a couple of times) - Compared to some other phone services this is a bit pricier because it charges per user. Recommendations to other buyers: A very important factor of this SaaS is that it gives the freedom of multiple numbers and country codes. If you're looking to expand your business or already offer your services in different areas, then this is a great solution to looking more professional and expanding your audience reach. Make sure to evaluate what your team needs before selecting a plan, each of their plans offers new things that may be detrimental to success, or potentially a wasted feature that does not call for the excessive spend. Also, definitely try out the Free trial, see for yourself if this is something that fits within your businesses needs! Comments: Aircall used to be a solid product with fair pricing and good support. I don't know what's changed in side their company, but something has gone wrong and now their product and customer service are suffering. Pros: They have dedicated apps for all the major devices (iOS, Mac, Windows, etc). They have a good website that's easy to find what you're looking for. Cons: I have to begin with the fact that their customer service is horrible and screwed me out of so much money after they changed the product without warning. I was on their enterprise plan and paid for the entire year upfront for all my users and lines. 6 phone lines, 4 users. I was supposed to get an account executive, but was never assigned one until 7 months later when I had a major issue happen and asked where my rep was. She had just been hired maybe 2 weeks prior, she said. Halfway through July 2017, the engineers accounted a bug in a feature we depended on. They issued a 'bug fix' by removing the entire feature without warning! 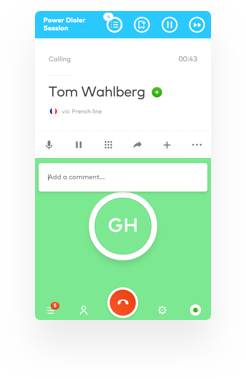 Without this feature, we couldn't use the Aircall service. I had several phone calls with them and maybe a dozen back and forth emails, but Aircall wouldn't add the feature back. I politely asked for a refund for the remaining 5 months of service and they flat out refused, even though the product I paid for had changed, I didn't sign a contract, and there was nothing in their TOS about it. Now, I've paid for 5 months of service I'm never going to be able to use because Aircall removed the function we needed. This is AFTER I'd written glowing reviews on various ecommerce platforms, told other entrepreneurs to get it, and again, paid for an entire year. Outside of that, the software always seemed to be loaded with bugs. They do not add features very often, including some that are needed badly. You also can't put customers hold hold when you dial them - only when they dial into you! I would strongly suggest skipping Aircall and trying out something like Dialpad or Talkdesk. Pros: Aircall integrates seamlessly with Pipedive to make our groups task easier. The phone numbers extracted through pipedrive email marketing campaigns are fed to Aircall and our phone markering people will take the charge at this point. Aircall has a great advantage that it works very well on the phone app which we never need a phone number to make the call. It cheaper as well compared to the services it offers. Cons: Aircall is the app in which I daily use that gives most minutes of downtime everyday. The mobile app sometimes fails to send out sound notifications even when the sound setting are set correctly. Pros: Whenever we are done with creating a product/service we usually give everything to marketing and sales team but I believe there should be one more thing needed, the customer service to answer product related calls. We have been not granted with great infrastructure to set up a group of customer service associates at our office but with the help of aircall, we set up remote agents from almost every continents. I could easily monitor activities and real time performance from my office and they even allow a great iPhone app to do everything at great convenience. Cons: They do not offer anything for companies below 3 employees. They won't allow registration using webmail email addresses like Gmail and Yahoo and they only accept email addresses at a company domain. 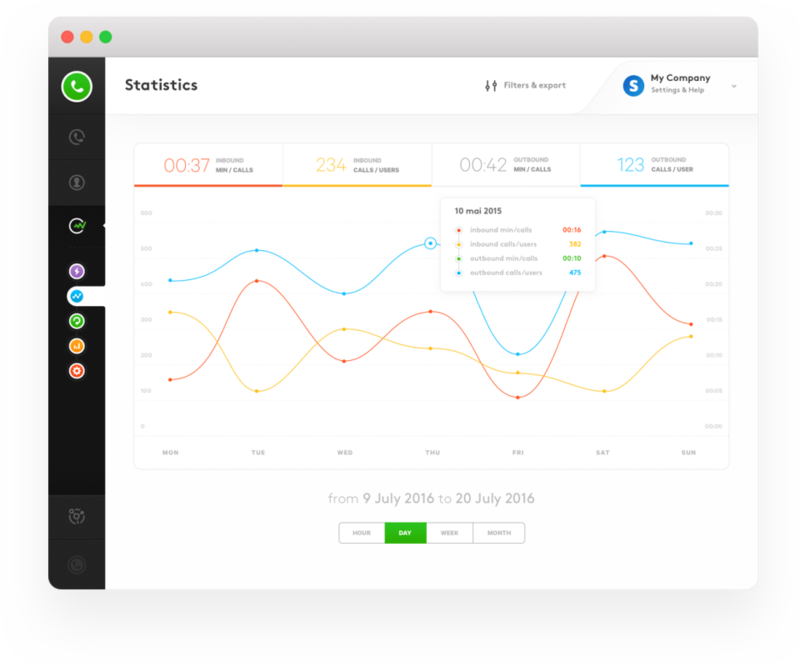 This causes freelancers and consultants to not using this app. Comments: We have been using Aircall as a replacement for a traditional phone-based hotline system that served to connect students (and faculty/staff) with our team of media production experts who offer just-in-time support for video and audio projects. Aircall integrates perfectly with a Slack - Talkus - Aircall workflow that allows for using our team Slack channel to funnel both calls and chat requests through a #support channel. This enables the entire staff to be more responsive to support requests. Aircall itself also offers features that we had not previously been able to leverage like cascading ringing, customized hours generally and for specific users, easy transferring of callers and more. Pros: Aircall is easy to set up, dead simple to use but hides a host of powerful features beneath its slick façade. Cons: The mobile app is a bit rough around the edges, but that's minor compared to the above. Recommendations to other buyers: If you need a web-based phone platform that's fast to deploy, simple to use and exceptionally reliable, you can't miss Aircall. Pros: I love that Aircall offers my company the ability to sound like a full sized professional services company. Phone calls are everything at my business, I match people skills with businesses and it's extremely important to keep constant communication between all parties. Aircall lets me keep that constant communication whether i'm at the office, on my computer, or even need to switch phones. The parity of the service of a whole is an extreme value for the cost. Cons: The mobile app interface definitely isn't my favorite, however as Apps come, it's likely they will be improving that in the near future. The functionality is all there, just the UI/UX and layout of everything isn't the most appealing. Hardly a reason not to try Aircall out though. Recommendations to other buyers: Be sure to make sure whatever VOIP/call service you use matches with your companies needs. There's lots to choose from, and all offer a variety of different features that may benefit you, or may end of leaving you paying for things you don't need. For me personally, AirCall fit everything I needed my phone system to do, at an affordable cost that wouldn't cut the budget somewhere else. Multiple numbers, cross-device integrations, flexible forwarding, and email-voicemails are all great features that make a difference to me. Make sure whatever you pick has what you need! Pros: I use Aircall every day and it's very easy to use. Call quality is good. Very easy to use app for both my Mac and iPhone. Easy to import contacts via CSV. Love the office hour options to automatically make calls go straight to voicemail. Love that you can call right out of the mobile app so I don't have to use my cell number when I'm not at my computer. Great solution for companies that don't want to spend money on a phone service and hardware. Cons: Wish there was a direct Salesforce integration so that all my "attempting to contact" and "active" are in my contacts. Often times they aren't up-to-date (due to me not pulling a CSV more than once a quarter) so I'm never sure if it's an Aircall coming in through the mobile app or if it's just a random number. Pros: The user interface is really nice and clean. Something I've found lacking in so many other VoIP providers. Cons: There are several bugs we've reported over the past year that either take a long time to get fixed if they get fixed at all. We found a workaround for most of our issues though. Overall: They were VERY helpful in assisting us with transporting over our 15 or so numbers. Since then we've gotten many more numbers, and because of our use-case, they've worked with us and have allowed us more reach than we really should have. That being said, we're a call center and have calls coming in and going out constantly -- we need far more details in the reporting area than they currently offer. If they could tighten down this area, I would have given a better rating honestly. But this also comes from someone who needs statistics to make daily/weekly/monthly decisions internally. Pros: Aircall was really easy to setup, and the team were very helpful and forthcoming with information. They integrate really well with lots of different CRMs and that's where the most useful features of the system come into play. Cons: It's quite expensive per user, almost twice the cost per user of our current physical phone system, and more expensive than other software phone providers. There also were some strange issues with the bluetooth streaming protocols forced on bluetooth headsets when using their app which hasn't been present in other similar apps that I trialed and tested. Overall: It has allowed us to have a remote team and grow our business and double the amount of support staff in a very short space of time. Cons: - Doesn't show phone numbers from Mainland China (A crazy and huge market for us to support and also where the main income from), instead we just received as Anonymous call. Call back is impossible. Pros: Their phone system is very easy to set up and use. We were up and running in less than a day. In addition, the phone app makes it even easier to connect with customers while out of the office- no being tied to a traditional office phone system. It has ultimately made us a better company for our customers, allowing them to reach us wherever we may be in the world. Cons: There have been a lot of updates recently- can get annoying when constantly restarting and updating the app. However, as a tech company ourselves, we understand the need to fix things and push them out to customers. Huge Help In Customer Service! Comments: We've played around several phone systems for our customer service team in recent years. We've had to drop some of them due to incompatibility issues. It has been a success with Aircall. It's not only user - friendly, it has also the best overseas reception. We've never had issues with call connections and compatibility so far. Highly recommended! Pros: The ease of the interface is absolutely helpful, especially that we multitask often. Everything is at your glance and does not get in the way of our customer service system. Cons: We have yet to discover one and when we do, we will be sure to reach out. Recommendations to other buyers: An absolute tool, highly recommended! Pros: Initial setup was very quick and easy, it took no time at all for us to get everything installed and configured correctly. Aircall integrates with our other systems and programs seamlessly, allowing our email campaigns to feed information through with ease. 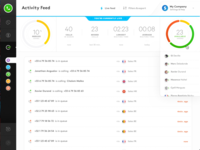 Aircall also offers the ability to track performance and activities across the globe, particularly useful for us when contacting international applicants / students. Cons: The connection strength can be shaky at best, since Aircall relies on an internet connection this is to be expected, but for our staff who are off-campus somewhere else in the world this can be particularly annoying. It took me and our team some time to get used to the user-interface, trying to figure out where everything is really was a pain. Also, this is made even worse when using Aircall on a mobile device. Pros: The dedicated account manager, the ease of integration with other platform, the scalability, the ease of team management and configuration, the ongoing improvement of features. Keep up the good work guys ! Pros: Aircall is really easy to use. It gives me feedbacks regarding my connection and allows me to reach out to customers in different countries easily. Cons: Every time that I disconnect my headphones or earplugs, it asks me to restart the application. When it happens when I had previously typed the phone number, it is inconvenient. Comments: As a industrial furniture manufacturer, we use Aircall for all our phone lines. 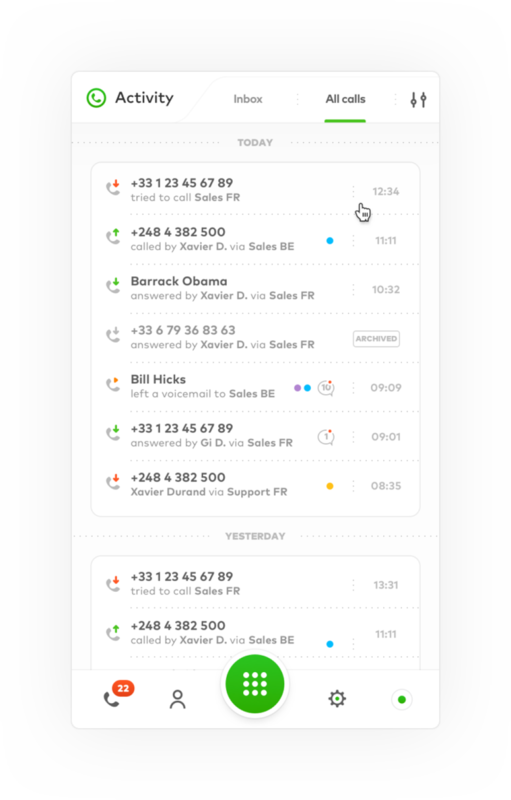 BARAK'7 is active in 4 countries and Aircall makes our live so easy that I would highly recommend the service! Very convenient for multi-employee use of the customer service hotline. Cons: The audio quality can be unreliable when wifi connection slows down and the desktop app needs to be launched before plugging-in the headset in order for it to work properly. Pros: Our customer support team is spread out across the country. Aircall allows us to stay connected and take care of our customers the way we like. 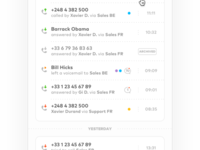 We use Aircall as our primary phone and love the routing features to direct the right customers to the right support. Pros: Easy to use, good to use with the team Great - We experienced problems last year but the support was really good - the efforts were put to fix it ! Cons: There is a big problem when I'm connected at the same time on my laptop and on my phone. I would like to be connected on both when i'm not in front of my computer ! Pros: Aircall is an easy way to make calls from anywhere with an internet connection. Love how I can easily have a network of calls that get routed between our different reps.
Cons: It is quite pricey, and I found some of the software to be a little buggy lately, but overall it's very user friendly. Comments: I have been using aircall for more than a year now. I must say its a perfect tool for small businesses. Its cost-effective and does the job. I wont hesitate to recommend it to anyone. Pros: Aircall has been a great app! Its easy to use, and does exactly what you need it to do! ITs nothing too fancy, but delivers on clear/quality calls! Cons: Not a lot of cons about this particular app. Its very simple, and easy to use. Which is great! But it doesn't offer any other features. Great product, definitely fits our needs ! Pros: This product is very easy to use and allow us to manage our international communication systems. We were able to integrate phone systems in a very lean manner, using our existing devices (laptops, iPhones) and we were able to connect with clients and business partners from all over the world, using local phone numbers. Cons: So far I am very happy with this software, I haven't had the need yet, but maybe having Android app might be beneficial to some users. Recommendations to other buyers: I would recommend explaining why and who they use, and how it helped them perform better. Comments: I have had a good experience with Aircall in these couple of months. Call quality is cool. The app for android has improved a lot since the first time that I used it. I love it because I can now receive calls directly to the app and I can also forward them to any phone number, if needed. Customer support response time is very short and I am really satisfied because of the solution to my problems. They are very polite and are always willing to help. That´s attractive for customers in general. Make the customer always feel as part of the family. Cons: -Cannot play with some settings through the app. That´s it! Recommendations to other buyers: If you´re considering Aircall, it is highly recommended. I´m in love with it. Comments: I am really happy i found Aircall on my road. We used to have a standard fix number for our compagny so it was difficult to receive call when we were out of the office, we couldn't know who was calling, and if my boss had been able to answer the call. We always had to tap the numbers by hand on our old traditional phone, time lost. Now we increased our mobility. I live abroad and my clients do not know about it, they feel like i am still at the office. We are able to anwser more calls, share our history of call and seach for name in the contact list. Pros: We keep our old OVH phone number so our clients do not get lost. We share our contacts and calls history within the team I am able to anwser from my computer (wifi) and from any mobile phone (french/italian) depending where i am. We receive vocal messages by email We do not need to tap the number by hand. We search for them. We import our Gmail contact list I feel more productive because at the end of the day i can see how many call i did. Cons: Sometimes i am not quick enough to answer the call Sometime the app restarts or get slow. But we can see improvements every weeks. Makes the call process easy! Pros: The built in note taking option that can be made into an Intercom conversation is super helpful. Also, the internet browser add-on makes clicking on phone numbers to call a breeze! Cons: There isn't anything I can think of at this time. Comments: A very good call cloud center. The quality is perfect I never had an issue. You could use it on your desktop and phone. Pros: Easy to set up, the pricing is way better than most VoiP providers, and the user interface is easy to use. The soft phones work really well and the call quality is as good as it was on our desk phones. They handled all of the number porting and even set up the user profiles for me. No outages to date. Cons: The support is a little slow to respond, but any issues that I've had since using them haven't been seriously urgent. Overall: Great price for the value of the software. Easy IVR process and my agents all trained on it to the point of proficiency in less than 1 hour. Pros: I love that we have the option to work with small markets like the Baltics and Central European clients. 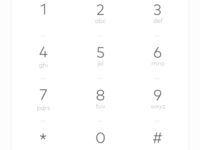 Aircall enables us to have numbers in all of those countries. Setting up Aircall was a breeze, the support has been there for us to make sure that all of our setup is enabling the best use case. It was easy to teach employees to use this app and make it a part of our daily routine. Cons: The con of Aircall for us is that I have to manually download contacts from Intercom to upload them to the contact list in Aircall. Excellent service, Very few issues. Comments: We changed from a basic landline service to Aircall. It is simple to set up and use. This is the first time that I have used a VOIP and being able to change from using one phone number to another at the click of a button is very helpful. I haven't had any problems with the app so far so I haven't had to contact the customer support team, but you do get very short polite messages from their support team every now and again, just making sure that you are not having any problems with their service. A nice feature which I would like to see added to the app would be a basic reporting system. Being able to see who is making the calls and who they're calling is a great feature of the app but I think that they could take it forward one step and add in a reporting aspect. Pros: It's extremely user friendly. Very easy to set up. The quality of the calls internationally is top notch. Cons: The band width when using the head set is much higher than when using the phone and as a result the line can be muffled or even drop out from time to time. That's more down to the high volume usage of our own lines. Pros: We use this on a daily basis and rarely have issues. It works simply and effectively and allows you to use multiple phone lines and channels. Pros: I feel like Aircall is great for people who only need a phone system. 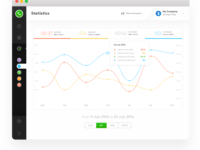 The interface is pretty straightforward and easy to use, and you can track analytics too! Cons: Other softwares already have this capability (i.e. Skype) including international calling. Why not choose them instead? Comments: We were reviewing VoIP options and me really, really wanted to like this one. We ultimately went with something else but if you have a small-medium sized company this should meet all of your needs. It has an attractive interface and has very favorable pricing for what it is if you have a small team of 3-5 people. Pros: I really liked the analytics tools. If you are looking for something to enhance your sales and marketing tools I would say that is the single most useful thing. It also offers integration with Slack and I imagine more features are on the way. Beautifully functional, easy-to-use with ZD integration! Comments: Primary use: Aircall enables our team to handle support-related phone calls easily. 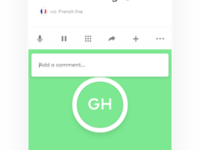 We can easily set it up a tree to have the calls forwarded to one teammate first, or have the calls directed to all our phones or desktop apps at once. Super easy to set up and easy to use. + Amazingly reasonable price for what it offers! Can't say enough about this great app! Pros: Easy to use, no glitches, great concept, allows me to do my sales calls to clients all over the globe with ease. Pros: It's easy to use and train staff on, reporting is okay. It's a LOT prettier than Grasshopper. It also integrates with Intercom, which is nice. Cons: The support could be a bit faster, I have a rep who has been getting calls even though she has herself toggled to the 'unavailable' state, and I submitted a support ticket on her behalf - haven't heard back in three days. Overall: It's been okay, I'm waiting for Aircall to really wow me with support. Pros: The app is basic and good for what you want it to do. It is very easy to use and effective. Setting it up is super easy and effective. The Mobile App is very easy to use and effective as well. Cons: The only thing that could be improved is that sometimes the phone app sometimes logs off without you knowing about it and that means that you might miss a call if you are not around your PC. I use Aircall at work and I won't be going back to other products. It's cheap, simple to implement and great results. Pros: Easy to share recordings of calls and listen to playbacks. If you have the Chrome widget installed, it makes it easy to call people there and then, without clicking in and out of pages. Cons: There is no warning when the net connection is bad and this can result in poor quality calls being made. As I work in sales, I always need a clear line to help build trust. Comments: Before Aircall, providing support and prospecting in 18 languages was a nightmare. As Green-acres is an international property website, we were doomed to the installation and never ending configuration of our own Asterisk server... With Aircall, we created each new lines in a few clicks and in less than a minute. Our sales team located a bit everywhere in the world just needed to plug their usb headset on their computer and ensure to use Google Chrome as browser. Voilà ! Migration of our legacy phone numbers to Aircall requested 2 weeks but was still easy. Bad point : Their invoices are still hardly understandable, but I was impressed by the commitment of the CEO to ensure I was receiving the needed clarification. Pros: Easy to utilize when handling clients foreign and domestic. Voicemail service is easily accessible. The clarity during my conversations has been flawless. Cons: The main difficultly I experience is when I'm not in Wi-Fi zones. The app uses alot of data. So I try to utilize this app when on Wi-Fi or connected directly to the internet.